A few weeks ago we spent the weekend in the West country, four legged friend in tow, to continue our search for the best Dog Friendly Hotels in the U.K. During our trip we stayed at sister hotels, very fitting we know, run by Olga Polizzi. Hotel Endsleigh, a secluded hotel in the Devon countryside, and Hotel Tresanton located on the Cornish coast. Both hotels are luxurious and dog friendly, yet special in their own way. Hotel Endsleigh is located in a stunning Grade 1 historic house, previously owned by The Duke of Bedford, surrounded by acres of land for you and your pup to explore. 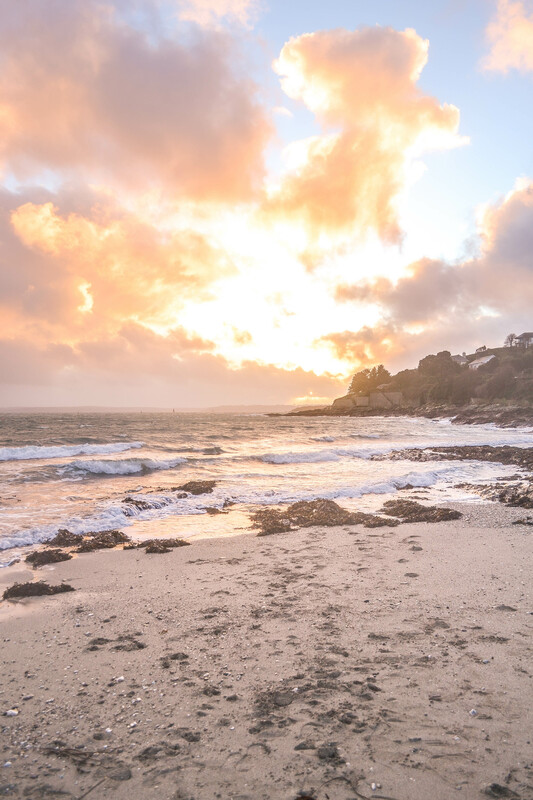 In comparison, Hotel Tresanton is more modern, made up of a cluster of houses on the seafront and two-minutes away from the beach, which is dog friendly in the winter months. Our first stop, Hotel Endsleigh. Now, due to car hiring problems and leaving London in the height of rush hour, unfortunately we didn’t arrive at Hotel Endsleigh until 9pm on the Friday evening. However, in our mid-drive ‘we won’t make dinner’ panic the hotel staff were super friendly and ensured us we would have plenty of time for dinner… and if you know us, then you know this was music to our ears. The idea of going to bed without supper would have been a ultimate disaster. A few hours later, as we were drawing nearer to the hotel and although it was already dark, we could see glimpses of the stunning woodlands surrounding the hotel… most of which was simply driving down the very, very, long driveway, finally arriving outside a beautiful country house. Even the lady at reception commented on the length of the driveway! Next, our breath was taken away as we walked into the amazing reception room, complete with dark wood paneling, an open fire and a huge Christmas tree. We have to say Gus loved the fire, we would often find him snoozing next to it throughout our stay. Once we’d checked in we were shown to our room, we were lucky enough to be staying in the Dukes old room. The room was beautiful and spacious, with an en suite which had been converted from the Dukes private chapel. Plus, the room was fully set up for Gus, with his own bed, bowl and dogs treats! But, before Gus was able to snuggle down in his bed after the long drive from London, it was time to head to dinner. For dinner the hotel had set up a private dinning room for us, therefore we were able to dine with our pup, water bowl included. Now, one thing we look for while staying in a Dog Friendly Hotel is not having to give up on the luxurious simply because we’re with Gus, including the food… something we didn’t need to worry about at Hotel Endsleigh! All the food was delicious, taking inspiration from the surrounding countryside and locally sourced. To start Natalie went for the Chicken Liver Parfait with Fig and Celeriac Remoulade, while I opted for the Truffle Honey Goats’ Cheese with Candied Walnuts and Rye Sourdough. We then ordered the classic Lamb Chump with Creamy Mash and the Squash Risotto with Woodland Mushrooms… all as wonderful as they sound. Now, you’re probably thinking that would have settled our rumbling tummies, and yes, yes it did. However, we can never say no to dessert. So, when the waiter told us we simply couldn’t miss out on the Pineapple Carpaccio, we gave in. Oh, and we ordered the Mandarin and White Chocolate Crémeux as well… it would have been rude not to. And, yes, yes that is an apple made of out white chocolate. The. Absolute. Dream. After an amazing dinner, Gus started to snore and our tired little eyes began to feel heavy, therefore we decided to hit the hay and explore the hotel properly in the morning. The next day we were up bright and early. After opening the shutters in our room we could finally see the acres of land surrounding the hotel, along with the gardens and the River Tamar. Even more so at breakfast, as our private room had windows over looking the hotel grounds. Oh, and did we mention breakfast was delicious?! Natalie ordered the Scottish Smoked Salmon with Scrambled Eggs, while I had the Full English, of course with a sausage on the side for Gus. Plus, while we were waiting for our hot food, we could stock up on the delicious continental buffet. From fresh fruit to granola and greek yogurt we were in heaven… not forgetting the pastries. Once we were full to the brim it was time to take our pooch for his morning walk, luckily for us, and as we may have already mentioned, Hotel Endsleigh has acres of woodland to explore. However, unluckily for us, the weather man had not been kind and the heavens had opened. Yet, all was not lost as the staff told us they had a selection of Hunter wellies to choose from and some umbrellas to borrow. Meaning we could still explore the grounds without getting absolutely soaked. Plus, we’d remembered to bring Gus’ rain jacket… no getting out of it little buddy. We spent the next hour walking through the gardens, across bridges over streams and even stumbled across The Shell House, a beautiful grotto decorated with shells in intricate and amazing designs. The grounds were stunning and if the weather had been better, unfortunately the rain didn’t take a break, we found some perfect picnic spots! However, one thing Hotel Endsleigh could offer in the miserable weather was a warm fire and the perfect armchair to snuggle down with a book. We could have spent all day relaxing with our books. However, once our toes and finger tips had warmed up, and Gus had napped by the fire, it was time to check out and say goodbye to Hotel Endsleigh. It had been a short but dreamy stay for us and our pup, with amazing grounds and delicious food! Furthermore, if we’d had more time and the weather man had been kinder, then we would have loved to explore the neighbouring Dartmoor National Park! But, for us it was time to drive down to the Cornish coast. Our next stop, Hotel Tresanton. Hotel Tresanton is only an hour and a half away from Hotel Endsleigh by car, and the route takes you through some stunning countryside roads and beautiful scenery. Plus, as avid Poldark fans, we were super excited when driving past road signs for Truro! Located in St Mawes, an adorable British fishing town, Hotel Tresanton is built up from a collection of houses upon the hillside. Luckily for us our room was on the seafront. It was modern, had an amazing bay window overlooking the sea and a view across to St. Anthony’s Lighthouse. Again, the room was perfect for Gus, he had his own bed, bowl and box of treats! Next, it was time to explore St Mawes. Finally the rain had finally stopped and blue sky was breaking through the clouds. First, we walked up to St Mawes Castle, an artillery fort built by Henry VIII which provides stunning views over the coast. Then, we walked into town past all the adorable houses along the sea front. It was very, very windy walk! After the sun had set it was time to head to the Dog’s Bar for dinner, luckily our table was next to the fire so Gus was able to snuggle up at our feet while we ate. The menu was similar to Hotel Endsleigh and again all the food is sourced locally, therefore we knew we wouldn’t be disappointed. For starters we opted for the Chicken Liver Parfait with Apple Chutney and the Mozzarella and Prosciutto di Parma salad. Followed by the Mushroom Risotto and Shoulder of Lamb with Roasted Root Vegetables. It is safe to say after two nights of delicious and hearty meals we were rolling along the seafront back to bed. The next morning we watched the sunrise from the bay window in our room, the colours were absolutely stunning, creeping over the rolling hills across the sea. After the sun had risen, we left Gus in the room to have a lie in and headed to the main restaurant for breakfast. Our table was located next to the window, providing beautiful views over the coast below. Again, Hotel Tresanton had an amazing continental spread with fresh fruit, greek yogurt and pastries. Followed by hot food from the kitchen. Natalie stuck with the delicious Scottish Smoked Salmon with Scrambled Eggs, while I went for the Smashed Avocado and Poached Eggs on Sourdough. The perfect breakfast to set us up for a morning of exploring the coast. After checking out of Hotel Tresanton, our perfect haven by the sea, the staff recommended we drive round to St. Anthony’s Lighthouse and explore the coastal walks… so, that is exactly what we did. The drive to the lighthouse took around half an hour, providing stunning views along the way and beautiful countryside. From the carpark we walked along the hills on the coast down and past the lighthouse, overlooking the sea below and views back onto St Mawes and Hotel Tresanton. It was the perfect way to take in the natural beauty while giving Gus his morning exercise and new areas to explore. When it was time to head back down to London it was hard to pull Gus, and ourselves, away from the amazing countryside… meaning we would do it all again in a heartbeat! Hotel Endsleigh and Hotel Tresanton are both amazing hotels and perfect for your four legged friends! Both similar in delicious food, friendly staff and beautiful hotels. Yet, different in their own ways. Hotel Endsleigh offers you and your pup the opportunity to explore the Devon countryside and National Parks. While Hotel Tresanton gives you the perfect British seaside getaway.